ASU President Quinton T. Ross Jr. (R) poses with ASU Interim President of Institutional Advancement Lois Russell (L), Duchtown principal Nicole Shaw and two scholarship recipients. 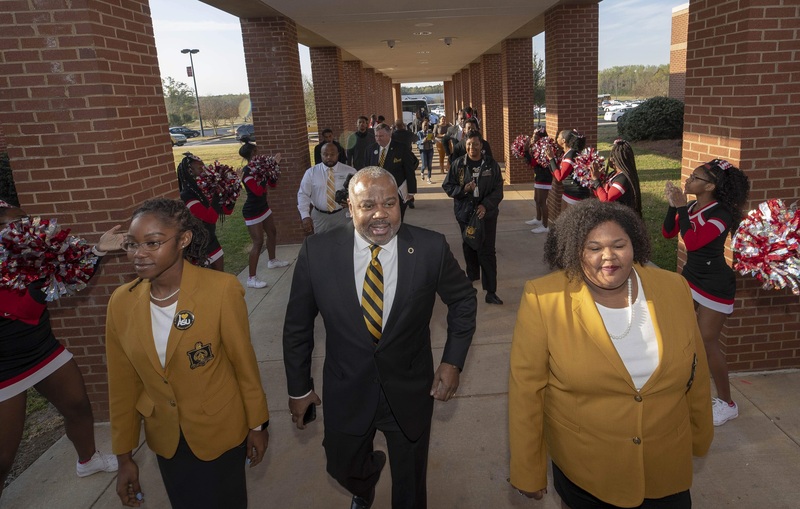 The 2019 Alabama State University President’s Tour, which is March-29-April 13, kicked off today in Atlanta, Ga., one of eight stops on the tour. The annual tour hit the highways to share an up-close look at ASU in an effort to recruit some of the best and brightest students in towns and cities across the state of Alabama and into the state of Georgia. 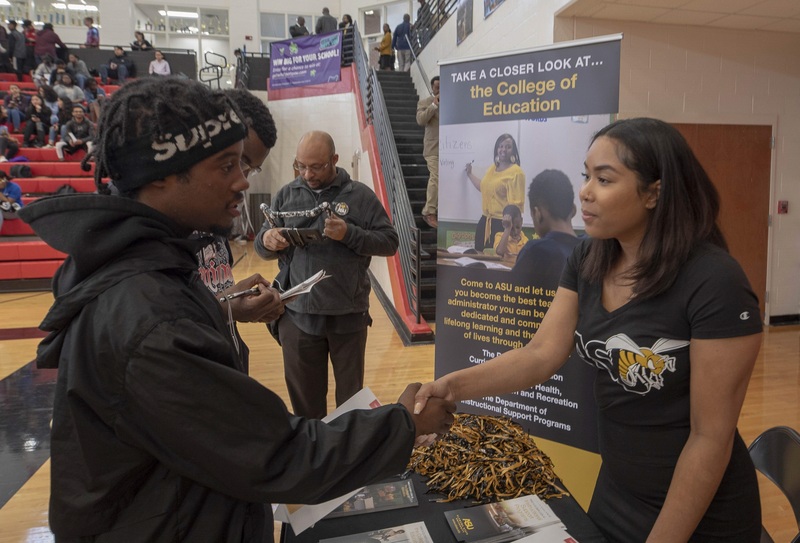 “We’re calling all Hornets to join us when we ‘buzz through’ your area and learn more about why It’s a Great Time to Be a Hornet!” said Alabama State University President Quinton T. Ross Jr.
On the tour, President Ross and his road team (consisting of students, faculty, staff and administrators) will connect with students and parents from multiple high schools, host college fairs and alumni receptions and sign historic MOU agreements with area community colleges to provide a pathway for students who have achieved their two-year or associate degrees to enroll at ASU to attain their bachelor’s degrees. 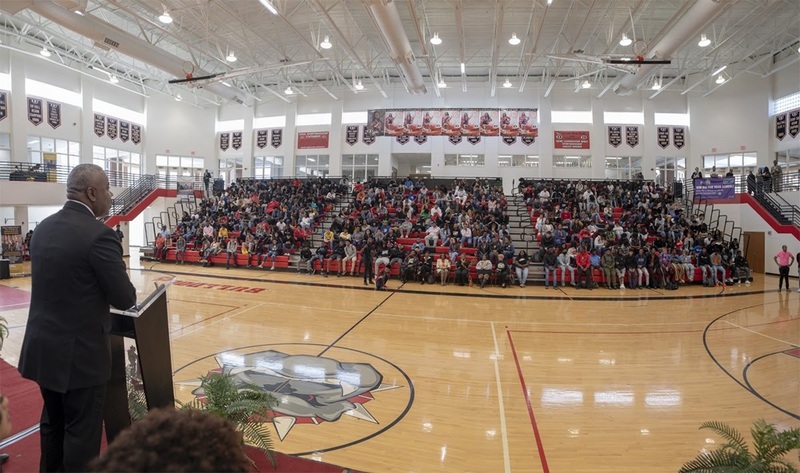 On Friday, President Ross and the road team took the ASU bus to visit Dutchtown High School and Booker T. Washington High School, one of the oldest schools in the Southeast. “We are overwhelmed with pride at Dutchtown High School where Nicole Shaw is the principal. 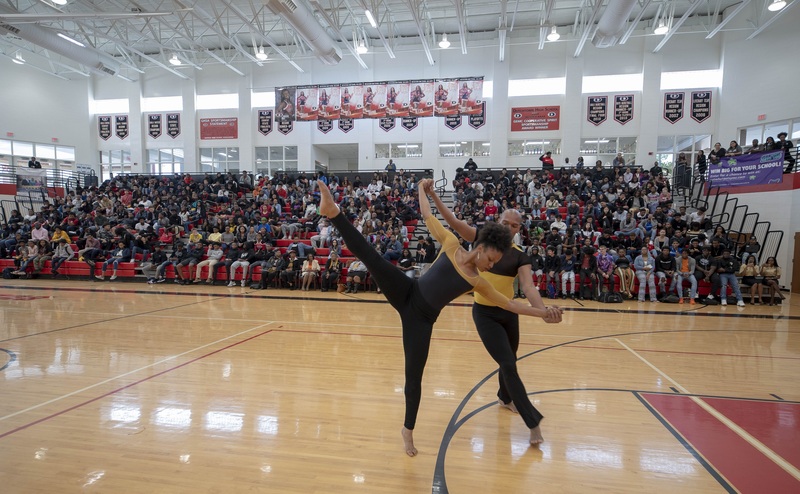 They rolled out the red carpet for us and allowed us to come in and talk with all their seniors and juniors,” Ross said. “We are so thankful to the principal, her faculty and staff to allow us to come in and show what The Alabama State University has to offer. ASU was able to make some students’ dreams of going to college come true. Ross said there also were students auditioning for the University band and music department. “We are using the tour as an opportunity to bring ASU to the various schools and engage and recruit students. But it is also a time to engage our alumni to let them know ASU is alive and well and to come out and support the school. It’s also a time to thank them for what they do for the University on a regular basis,” Ross said. Prater, who is also the Atlanta president of the Alabama State University Alumni Association, said he is extremely excited about the Presidential Tour coming back to Atlanta. Ross said he thanks his tour team for a job well done. “Our team did an outstanding job of representing The Alabama State University. There’s no other faculty, staff or student body like Alabama State University’s. I also thank our alums,” Ross said. The next stop on the bus tour is Mobile on Monday, April 1, and the last leg of the tour will end with a Hornet Extravaganza, which features the Black and Gold Game at the ASU Stadium on Saturday, April 13. “We have been received so well in the state of Georgia. The 2019 Presidential Tour has gotten off to an awesome start and we look forward to its continuation as we continue to build and move ASU 150 years forward,” Ross said. For day-by-day updates, follow the tour on ASU Facebook page (alabamastateuniversity) or visit the University’s website at www.alasu.edu/presidentstour. Come in your Hornets Game Gear!